Free delivery on garden machinery orders over £50. Two in one - that's the ZM02 Multi-Change® mini handle. On the one hand a practical handle for all Multi-Change® mini tools, on the other a hand grip for the REM and REPM Multi-Change® tree saws. Made from high quality plastic, the, the safety button at the grip end of this 16cm long handle protects against unintentional unlocking. WOLF-Garten's Multi-Change® range is specifically designed to be lightweight and comfortable to use. Each tool in the collection has its own unique features that make the tool work harder and last longer. The "every tool head fits every handle" Multi-Change® range comprises of 15 handles of different lengths (to suit your height and the task in hand) and around 50 tool heads to cater for any type of gardening task. When you find a handle that you love, you can choose from WOLF-Garten's comprehensive section of tool heads and just "click" them together to get any gardening done with a straight back. Once you have chosen the handle, you can keep adding to your collection of tool heads as it only takes a quick press of a button to release one tool head and swap it for another. Every tool head in this collection will fit whichever handle you purchase, so you can convert from cultivating to weeding to raking by simply switching tool heads and using the same handle, saving you storage space, money and, most importantly, a lot of backache! A handle is the starting point for any multi-change collection, whether it's for general use or for a more specific application. All the metal handles are made using recycled aluminium, while the wooden handles are FSC certified. Each handle has a guaranteed fixed seat enabling it to withstand vibration and absorb shock when in use. The Multi-Change® allotment tools range is designed with the vegetable grower in mind, but is equally as useful in larger flowerbeds and borders. These tools are designed to make light work of essential soil cultivation tasks and, when used with the correct handle to suit your height, will get the job done quickly and easily whilst keeping your back straight. The Multi-Change® soil care and rockery tool range incorporates all the tools needed to keep borders in blooming good health! Each tool has a solid, robust design with tines, prongs and blades that will resist bending, wear and corrosion. A comprehensive range of premium quality garden tools for a beautiful lawn, year after year. To create the perfect lawn it is essential to remove organic matter from the grass roots and to tidy up any straggly lateral growth every 6-8 weeks. All the tools you need for reaching the heights safely and without taking your feet off the ground or using a ladder. Choose between the 2, 3 and 4 metre extending handle and add the specific tree care tool head of your choice to maintain your trees with little effort. Useful tools for cleaning patios, paths, decks and ponds, even greenhouse windows. Help keep your home and garden spick and span, whilst saving your valuable storage space, time and effort. All premium hand tools in the WOLF-Garten Multi-Change® range come with a ten year guarantee for quality assurance. For more than half a century, WOLF-Garten has been working towards one important aim; to provide gardening tools and machiney of premium quality and performance that help make gardening easier and more enjoyable. In the UK, WOLF-Garten is better known for its high quality garden tools. 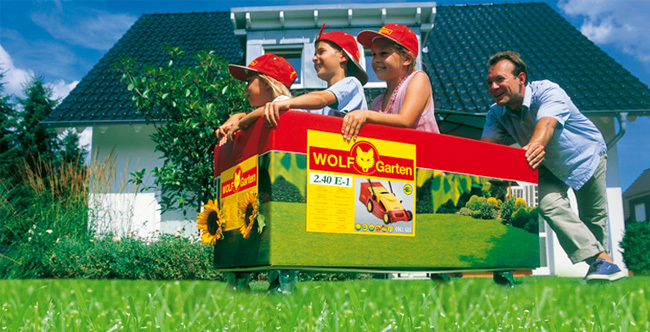 Manufactured in Germany to the highest engineering standards and using only the best raw materials, every product in the WOLF-Garten range is put through rigorous quality control tests to ensure it meets WOLF-Garten's exceptionally high expectations. For WOLF-Garten, being good means getting even better. WOLF-Garten stands for quality and competence in all matters concerning lawns. The company continues to develop its products and constantly takes its customers' wishes and demands into account. In 2007 WOLF-Garten was distinguished as "Brand of the Century". The WOLF-Garten brand name stands for the quality of each and every product. You can rely on this since the outstanding properties of its products have been tested and confirmed by independent experts and official channels in numerous tests and competitions again and again. This is evidenced by the large number of quality seals on WOLF-Garten products. Whether it's the top rating from a consumer testing association, safety-relevant test results from VDE, TüV or LGA, recognition by DLG, awards such as "Product of the Year" for exceptional design quality and special suitability for use - all these quality seals are your guarantee that you have chosen WOLF-Garten as the right option for quality, safety, function, handling, durability and environmental compatibility.